(CNN) -- In times past, Jerry Borbon would not have thought twice about the backpack-wearing young man he spotted strolling down a street in his Miami, Florida, community. 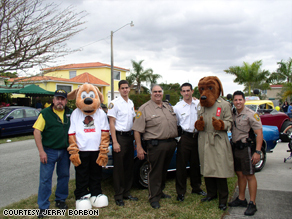 Jerry Borbon, Scruff, McGruff the Crime Dog and police officers at a Westchester neighborhood celebration. But times have changed. Now he's learning to trust his suspicions more. A neighbor saw the man trying to break into a house and called police. "There was nobody at home at the house," Borbon said. "[The alleged thief] didn't know that a neighbor was watching from her window." Borbon is a Citizens' Crime Watch volunteer for his Westchester neighborhood in south Miami, where residents have been trained to be alert to suspicious behavior and report it promptly to police. With the economic downturn, neighborhood watch groups are proving to be a first line of defense in battling property crimes. The Police Executive Research Forum, a Washington, D.C.-based independent research organization made up of local and state police officials, released a survey in January showing that 44 percent of police departments reported increases in crimes they believed could be attributed to the economic crisis. Of the departments surveyed, 39 percent reported an increase in robberies, and 32 percent said they had seen a rise in burglaries. The survey also revealed that while quality-of-life crimes are rising, budget money is falling. Of the 233 responding police agencies, 63 percent said they expected their total funding for the next fiscal year to be slashed. And as police departments grapple with budget cuts and hiring freezes, neighbors are stepping up and battling back against burglary, theft and vandalism. Police Chief Dean Esserman of Providence, Rhode Island, said that for a time, his department saw a dramatic increase in copper thefts resulting from empty, foreclosed homes and the increased value of copper on the commodities market. Things have gotten much better in Providence, Esserman said, but other communities haven't been as fortunate. "Most cities are having a tough time," said Esserman, who added that his department is dedicated to community policing and has a strong partnership with neighborhood watch groups. "In the last year or two, the economics have been really rough." Borbon said his community has definitely noticed more criminal activity. "We've never had so many problems before," he said. "Nowadays, you have so many people just walking around pretending, leaving fliers, doing marketing surveys or some such baloney. But what they really are doing is looking for opportunities, watching to see who is or isn't in their homes." Matt Peskin is executive director of the National Association of Town Watch, a nonprofit crime prevention organization that works with law enforcement and crime watch groups around the country. Peskin, who estimates that there are about 20,000 neighborhood watch groups nationwide, said there has been an increase in requests for information on starting groups from all over the country including urban, suburban and rural communities. "In a lot of cases, there are so many communities out there that already have groups that when you start to get new ones, you know that something's up," he said. "It does seem to be somewhat tied to the economy." Martin Floss, a professor and director of the Institute for Law and Justice at Hilbert College in Hamburg, New York, said that for the past 15 years, crime rates across the board have dropped to historically low levels. Floss, a former crime prevention coordinator for a neighborhood in Buffalo, New York, said that as the economy worsens, property crimes tend to increase. Well-trained neighborhood watch groups can be great assets to local law enforcement, Floss said. "If you can get them to organize, to look out for each other and to work closely with the police, that is only going to do good things," he said. A spate of vandalism and petty theft in his Las Vegas, Nevada, neighborhood prompted Doug Puppel to organize a neighborhood watch program in his area. Like Florida, Nevada has been hard hit by the crumbling economy and housing market crisis. Puppel said residents in such areas are motivated by concern for their families and community. "What's going on is not unique to Las Vegas, but what's unique that I'm seeing is that people are pulling together," he said. "It's probably easier for a person to start a neighborhood watch today than it would have been if times were better." Crystal Zohner lives in a gated community in Las Vegas and said her neighbors are rallying to send a clear message that they are united against crime. "It seems like now, since the economy has changed, [thieves] are getting a little bit more sophisticated and a little more brazen," she said. "It's time to get back to simpler times, when we did look out for each other." Robert Thompson, neighborhood captain for a watch group in Roswell, New Mexico, said that with police so busy and resources stretched so thin, members know they have to be vigilant when they patrol their neighborhood. But they also know that they are not the police, he said. "They are not going to confront anybody, but they are the eyes and ears," Thompson said. "I feel a sense of satisfaction because I am trying to make a difference in my community." The key to reducing crime in communities may be found in history books. University of Arizona economist Price Fishback has studied urban crime rates during the Great Depression and said there was a correlation between getting people back to work and decreasing crime. "If you are worried about crime, training programs and things that take people's time up help to reduce crime rates during a period when things are getting worse," he said. "For a 1 percent increase in employment, you found about a 1 percent reduction in the crime rate."